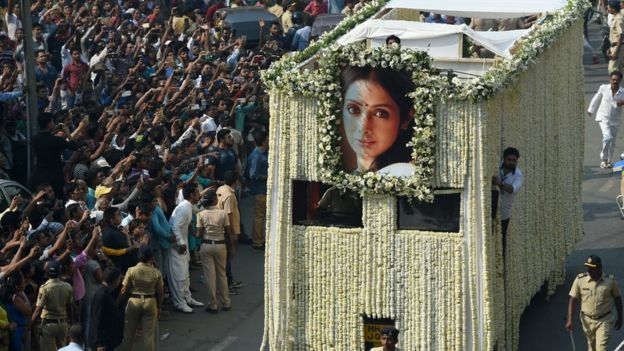 Bollywood superstar Sridevi has been cremated in the Indian city of Mumbai as thousands of fans gathered to pay their last respects. Earlier, crowds clutching roses queued outside the Celebration Sports Club in the city to bid farewell to the star. A specially decorated truck carrying her body took hours to travel the 7km (4.3 miles) to the cemetery. The actress, 54, was cremated with full state honours. She died in Dubai where she was attending a family wedding. 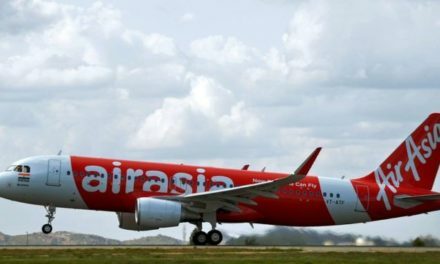 Police said her death on Saturday night had been “due to accidental drowning following loss of consciousness”. She was found in her hotel bathtub. It had earlier been reported she died of cardiac arrest. The full post-mortem report has not yet been released. Known simply as Sridevi, the actress was considered one of the very few Indian female superstars capable of huge box-office success without the support of a male hero. She appeared in nearly 300 films over five decades. Film stars from Bollywood as well as the south Indian film industry were among the mourners at the sports club in the Andheri West area of Mumbai, home to Bollywood. “Since I heard the news about her death, I have been standing outside her home for two to three hours every day, waiting for one glance,” Bhagirathi, an aspiring actress, told BBC Marathi’s Abhijeet Kamble. She said she was inspired by Sridevi to try her luck in Bollywood. Rajan Naidu, who has been a fan of Sridevi since he was a child, said he booked an entire cinema hall in Mumbai when her last movie, English Vinglish, was released in 2012. He even named his daughter after Sridevi. Another fan, Kalpanaben Kodekar, said she travelled all the way from the neighbouring state of Gujarat to see Sridevi “one last time”. “I’m really grateful that they allowed us inside and not just the celebrities. We’ll always feel the void Sridevi’s departure has created,” she added. Large numbers of police were deployed outside the star’s house, on the procession route and outside the Vile Parle Seva Samaj crematorium where the body was taken. It was complete chaos on the streets of Mumbai as Sridevi’s procession moved towards the cremation ground at a snail’s pace. Thousands of fans from Mumbai and India followed the truck carrying her body. Police closed one side of the road, bringing traffic in the area to a standstill. There was a visible air of sadness amid all the chaos – and fans were eager to get a last look at the star. People could be seen thronging the roadside and crowding overhead bridges. People who were still in line to pay their last respects rushed to see the body as it was being carried out. Police had to step in to hold them back so the funeral procession could get under way. Why was she such a huge box-office draw? Sridevi’s life on screen began when she was just four. She started her career in the south Indian film industry, acting in movies in all four major languages of the region. She was cast in her first adult role at the age of 13 – that of a woman avenging her lover’s death. She starred in classics such as Mr India, Chandni, ChaalBaaz and Sadma, becoming one of the only actresses to build a successful career in both south Indian and Bollywood films. Sridevi was rumoured to be the highest paid in her field and her star power and charisma persisted for years to come. She decided to take a break from the film industry after her marriage to producer Boney Kapoor and the release of Judaai in 1997. She made a comeback in 2012, starring in English Vinglish. In 2013, the Indian government awarded her the Padma Shri – the country’s fourth-highest civilian honour.